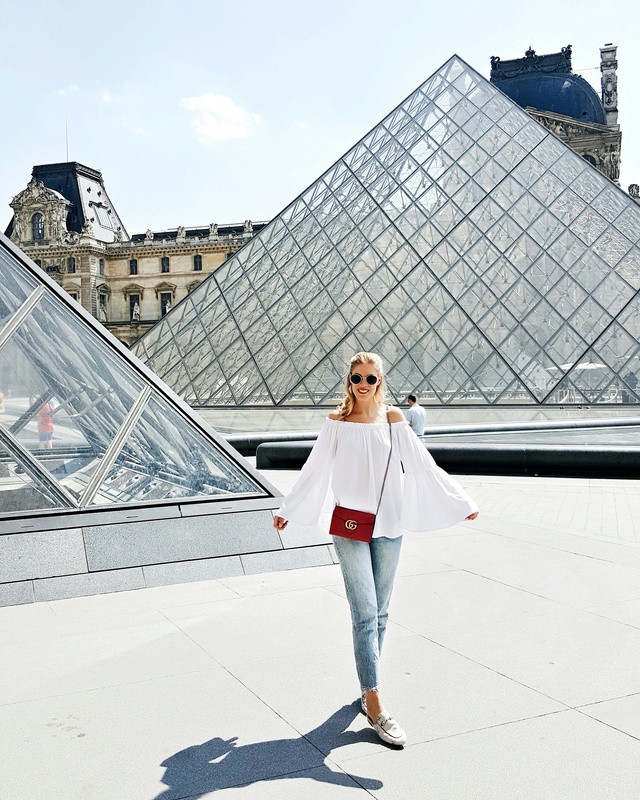 Musée du Louvre is a must when in Paris! The beautiful pyramids are impressive and surrounded by great architecture. I love that the location offers you many options what to do. 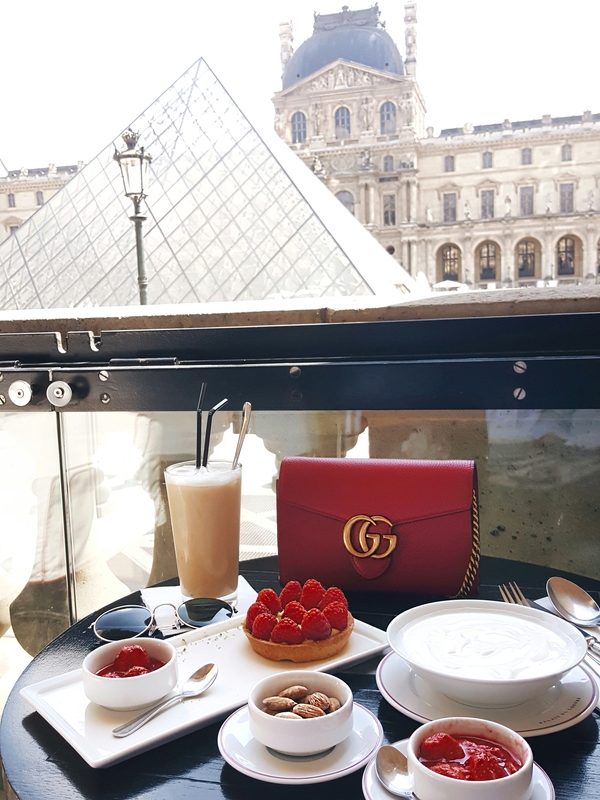 You can visit the Louvre and get inspired by great galleries, having iced coffee and some sweets with a great view or just take a relaxing walk through the beautiful ‚Jardin des Tuileries‘. Although the place is always overcrowded you will for sure find a free chair and a quiet spot to enjoy the parisian vibes! 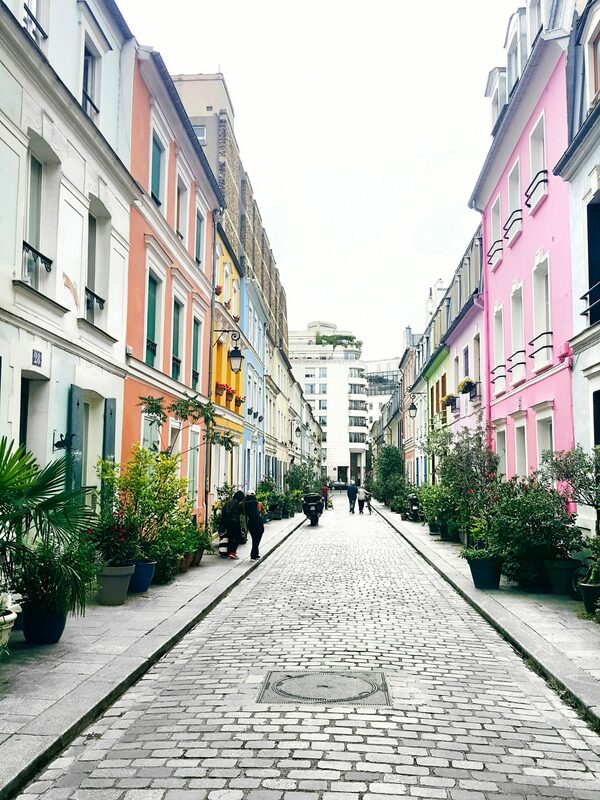 Paris is not only convincing with it’s charming white houses with little balconies it also surprises with pastel colored streets. 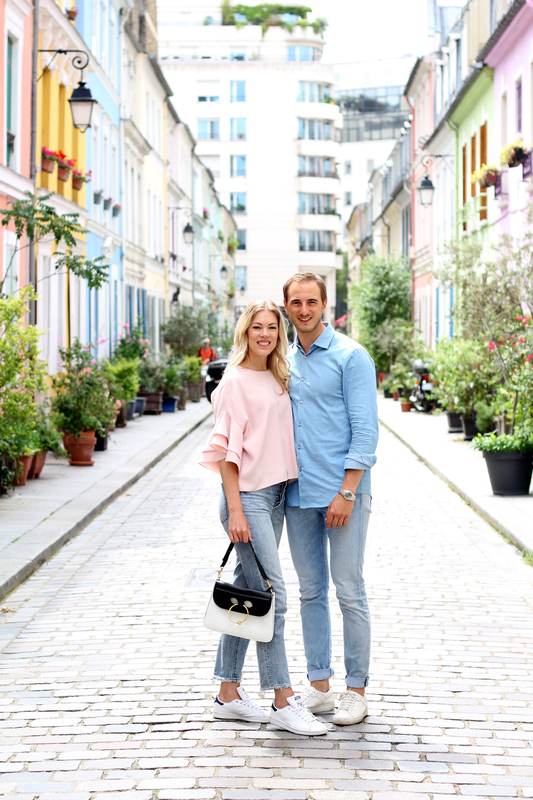 Rue Crémieux is another famous spot where everyone, trust me everyone, will take a picture even when the homeowners ask you not to. 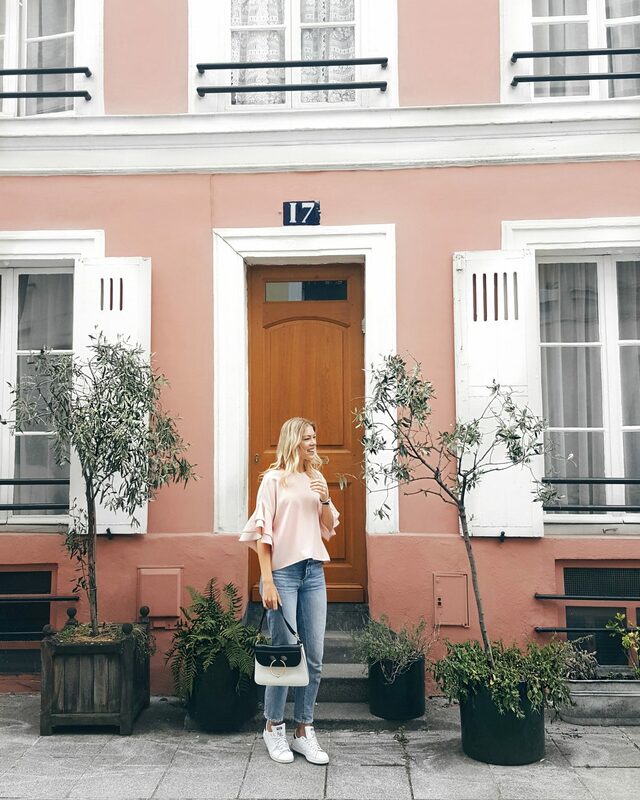 Maybe it was a lucky coincidence that my outfit is a perfect match to all the light blue and pink houses. Moreover, we had the luck that Philip and I met a photographer who was so kind to take a pic from us. Yay, Philip is on a pic with me! 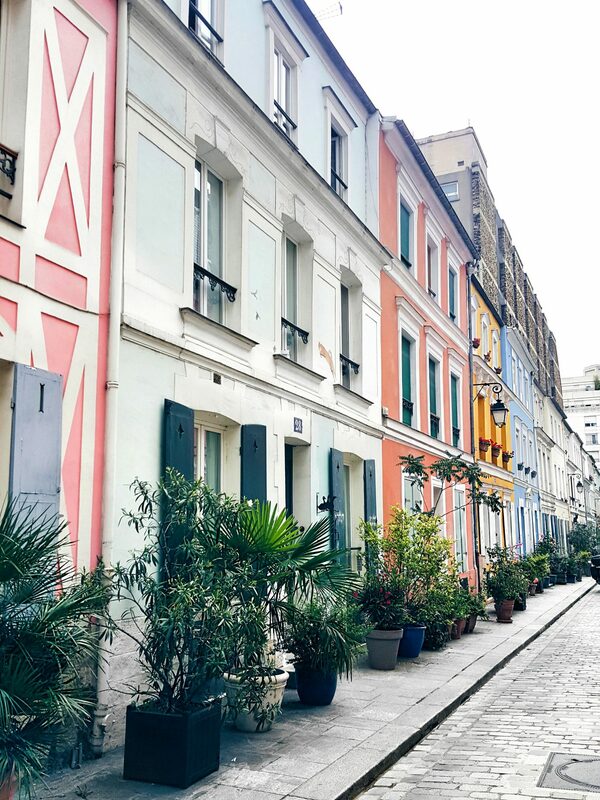 Furthermore, close to this amazing street is the arrondissement ‚Marais‘ which is full of little shops and cafés. We took the chance to explore both locations by bike because you can take a route next to the Seine! Honestly, I am a little bit addicted with hunting good food spots! 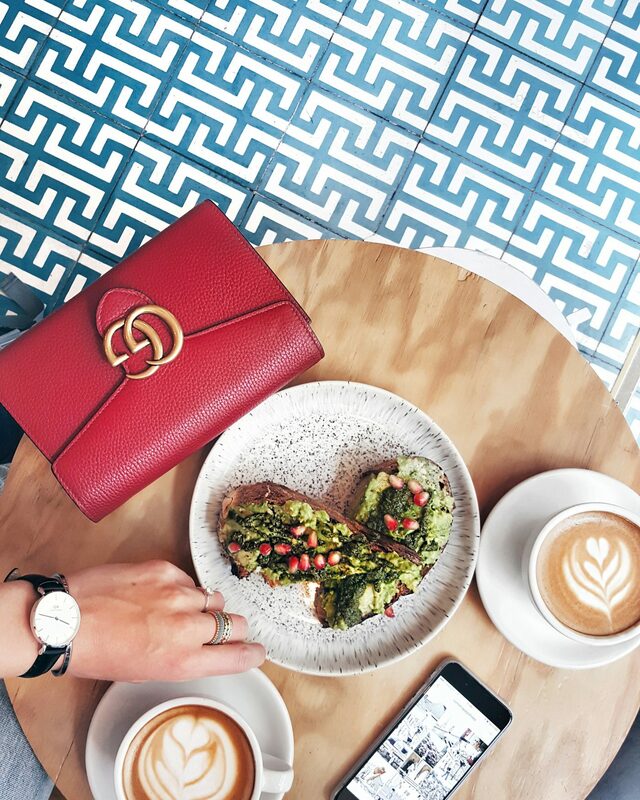 Since we are traveling more often I got myself always a well prepared list with the cutest hotspots. Thus, it’s much more easier to find the best Acai bowl in town. 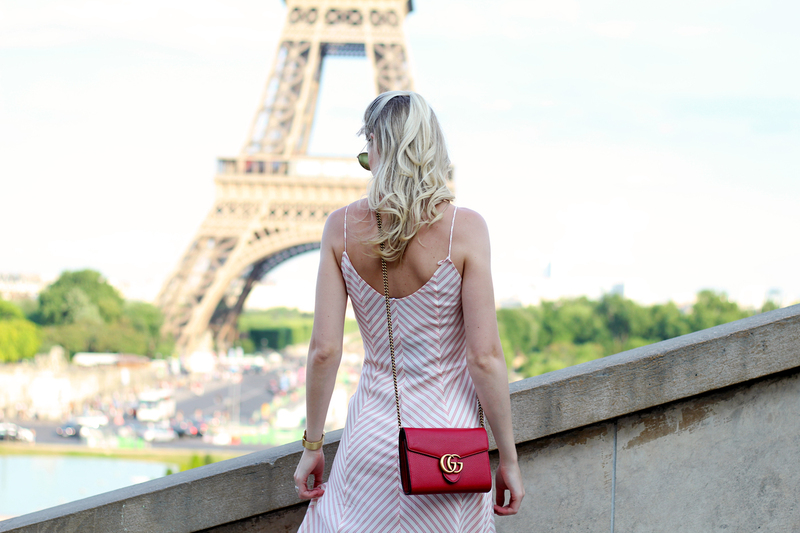 Well, I have some more typical blogger spots for you! 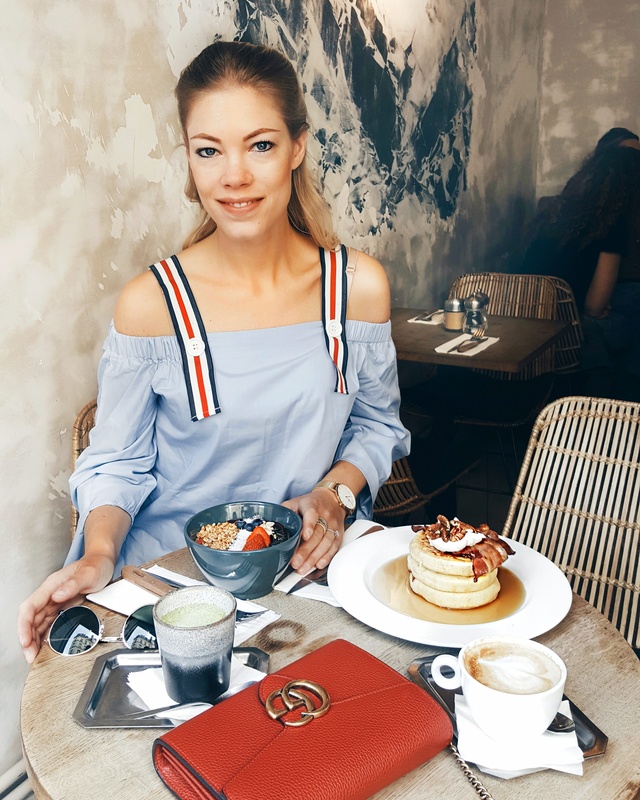 The Season is great for breakfast persons like me who need matcha latte and berries to start the day right! Very similar is the café Ob-la-di which is located in charming ‚Marais‘. Lucky us because we had the chance to take a spontaneous lunch break at Ober Mamma. The restaurant is one of the current hotspots and normally it’s fully booked. 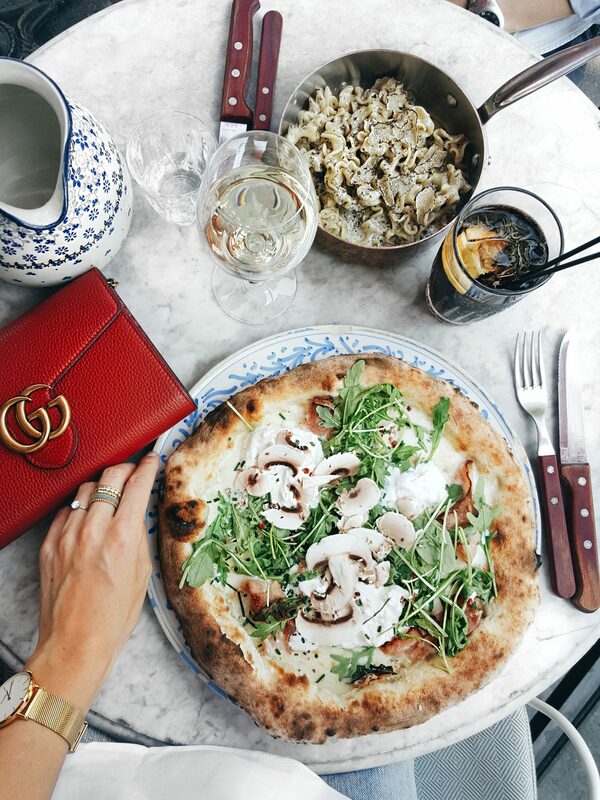 It was the best idea to have a perfect italian pizza with burrata cheese in Paris! 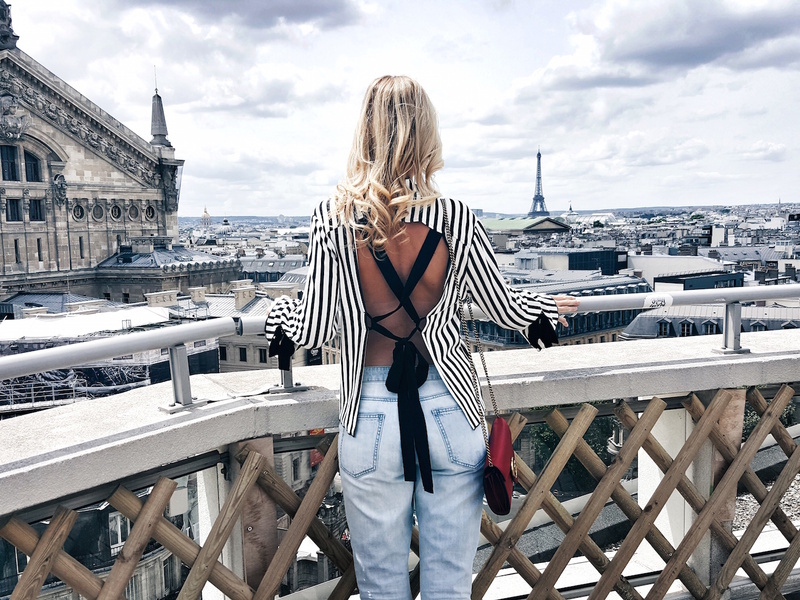 Looking for the best view over Paris my preparations took us to the Galeries Lafayette. Especially on a sunny day the roof terrace is worth it to have a lunch break there. And isn’t it a good opportunity to make a shopping experience inside the gallery. 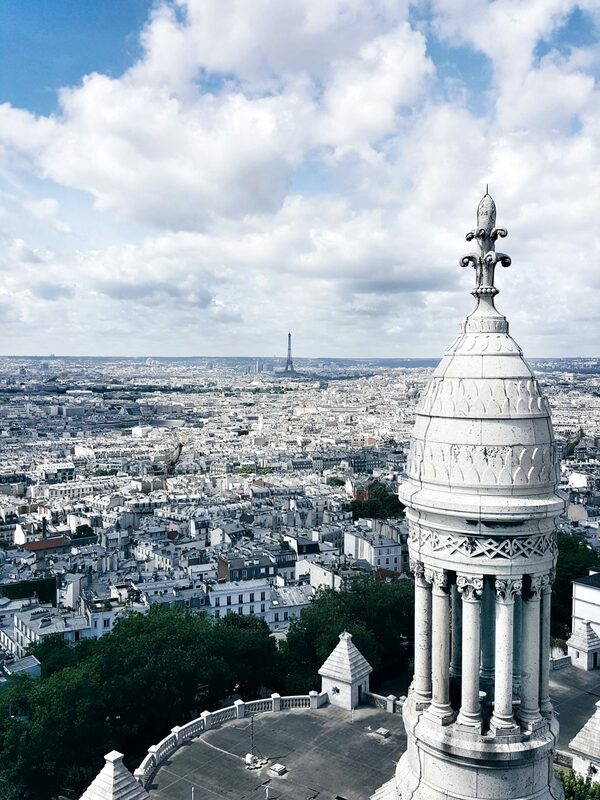 Further on, a great viewpoint is from the top of the Sacré-Cœur de Montmartre (entrance 6€). 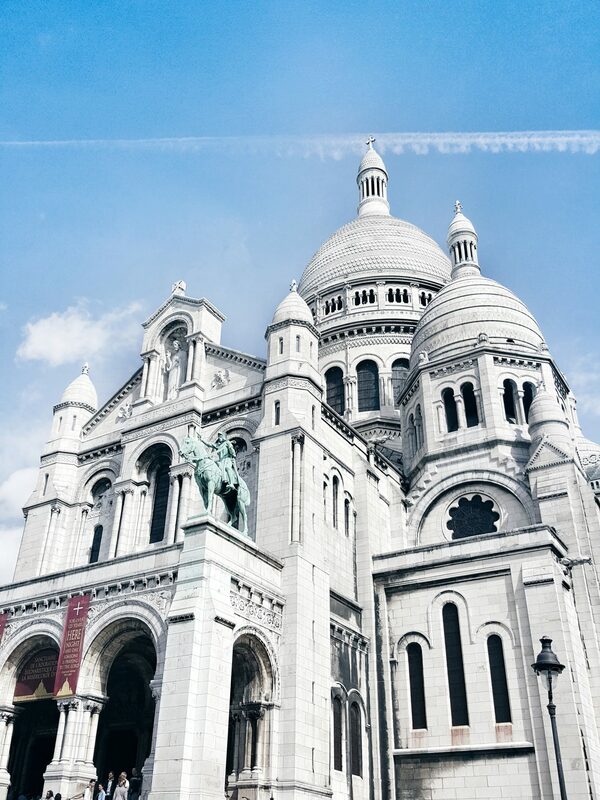 We lived near the basilica because Montmartre is a cheap arrondissement on Airbnb and advantageous because it’s near Gare du Nord. Beside an amazing view you have to challenge your athletic performance by taking all the steps up to the top! 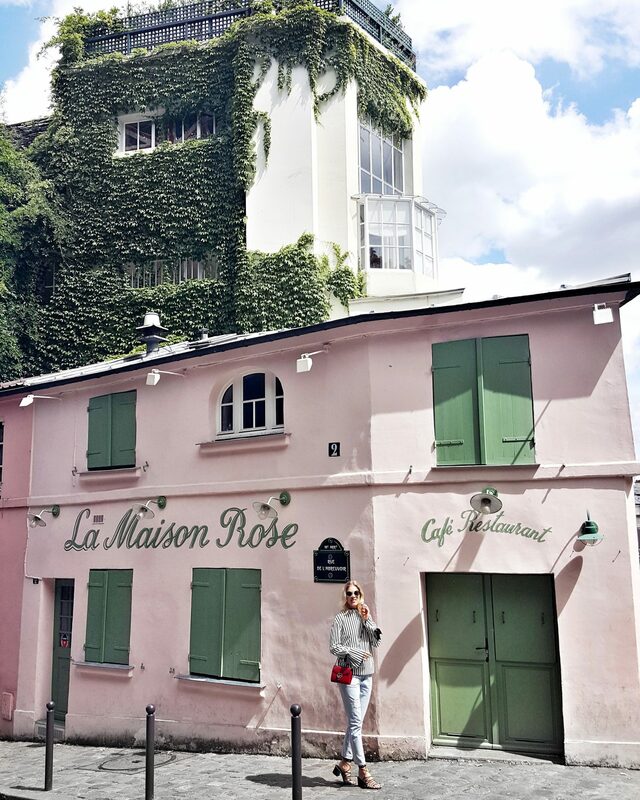 🙂 Close to Sacré-Cœur we spotted the cute pink house ‚La Maison Rose‘ but sadly the restaurant is closed since a while. ohhh dann hoffe ich meine Bilder konnten dich ein wenig mehr überzeugen! 😀 ja das passiert manchmal doch häufig zufällig! Aber gefällt mir auch sehr gut! Liebes das ist ein sehr Interessant Post! Mit ganz vielen tollen Einsrücken und Tips! All deine Bilder sind so schön! Du siehst auf jeden fabelhaft aus! Was für ein ausführlicher Paris Bericht – danke dafür! Ich möchte da auch ganz bald mal hin! 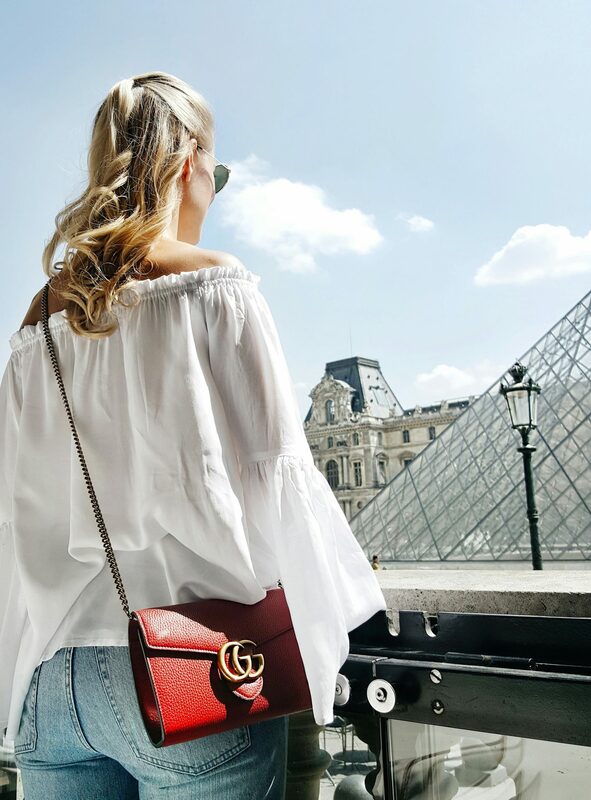 PS: Deine rote Gucci Tasche ist der Knaller! 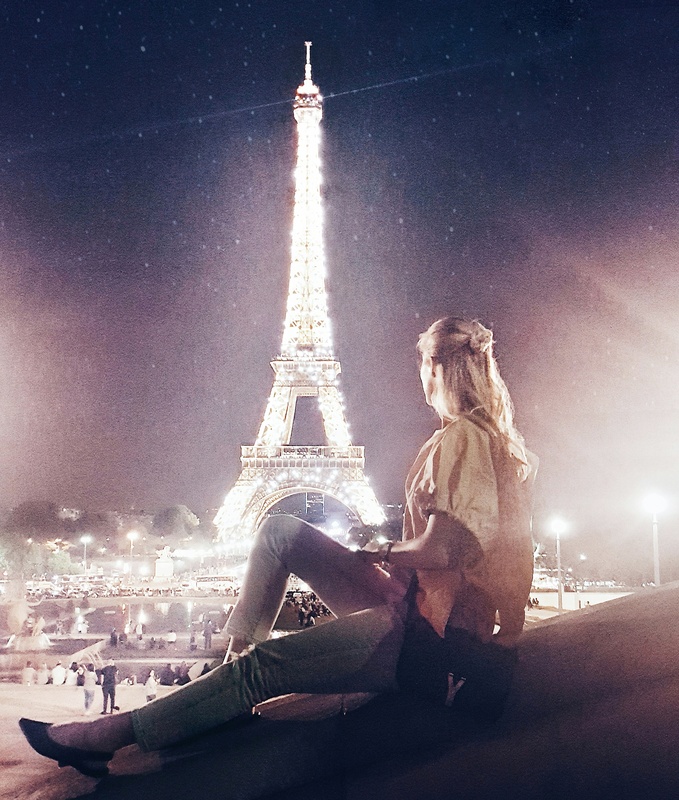 Was für wunderschöne Bilder du in Paris gemeinsam mit deinem Schatz gemacht hast. Auch ich habe viele Orte besucht und ich kam sus dem Staunen nicht heraus. Ihr zwei seid aber auch ein süßes Paar! Klingt und sieht nach einem tollen Trip aus! 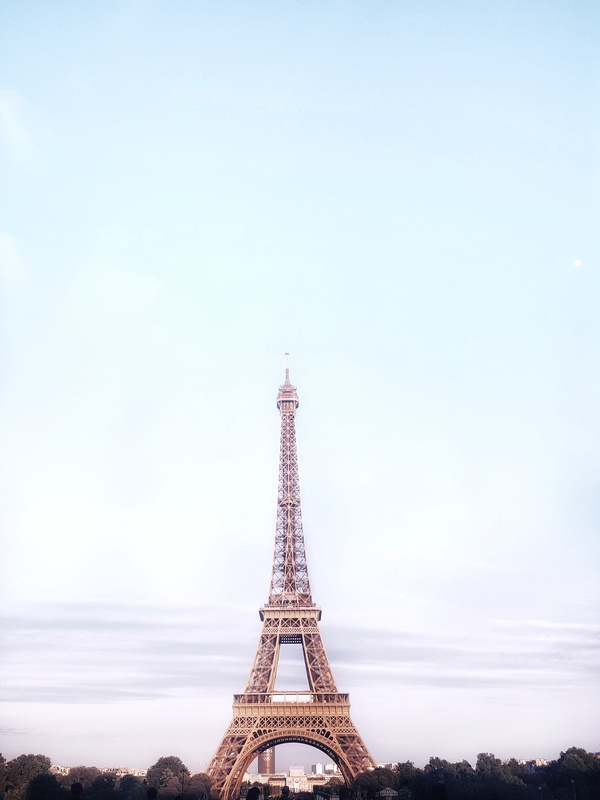 I really want to travel back to Paris soon! Every time I go I discover something new! so true my dear! This city is full of beautiful corners to explore! ich mag solche Post total gerne, man lernt immer wwieder was dazu und entdeckt ganz andere Seiten einer Stadt. ich bin ganz neidisch, Paris ist so schön und ich war noch nie dort -leider. Wundervolle Aufnahmen hast Du da. Wow was für ein toller Bericht über euren Paris-Trip. Die Bilder sind einfach wunder-wunderschön. Ich bin zwar schon viel rum gekommen, aber durch Paris bin ich bis jetzt immer nur durch gefshren?. Das wird sich aber hoffentlich bald ändern! ohjaa ich hoffe du findest Zeit die Stadt auch mal zu genießen! deinem Beitrag noch größer ? teilst ? vielen Dank dafür! das solltest du unbedingt machen! 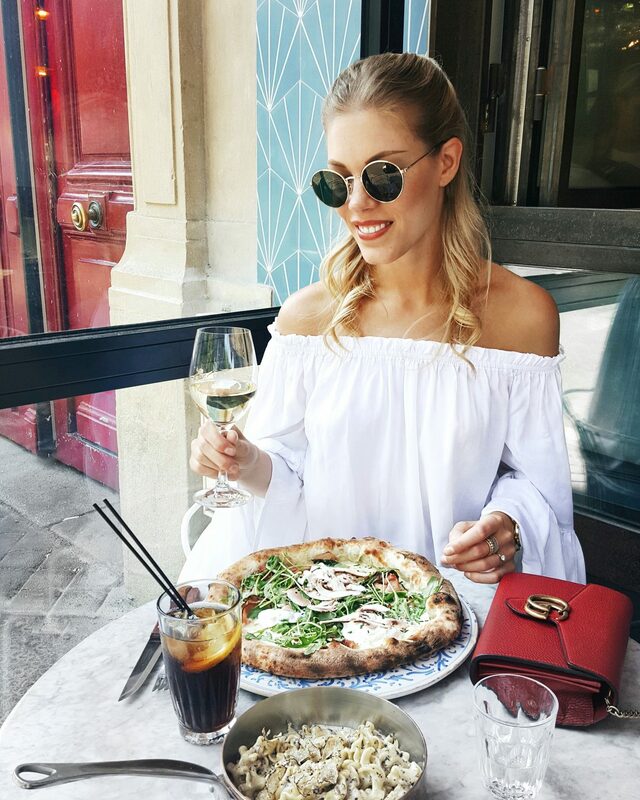 Paris ist einfach nur wundervoll! 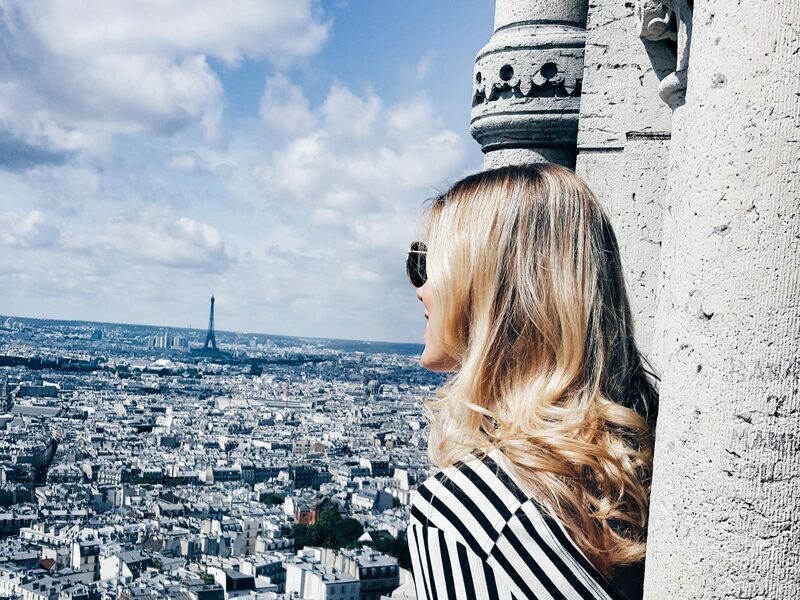 Ganz lieben Dank für diesen tollen Blogpost zu Paris – der Heimatstadt meiner Mama. Hast Du ganz toll in Bildern und Worten verfasst. ohh wie schön! Wohnt deine Mutter immer noch dort? uhhh Girl das freut mich sehr!